My first copy of Animal Crossing: City Folk froze when I was saving, so I exchanged that one for a new working copy of the game. I decided to start fresh (I had only played two days previously) and create a new town. It must have been destiny, fate, whatever, because lo and behold as I entered my new town, who do I see? 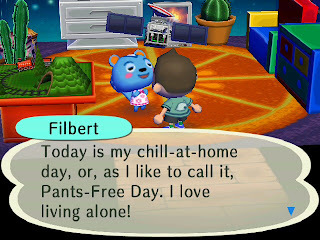 Some call my love for Filbert a psychotic disorder, but they are obviously jealous that I love a cuddly, talkative squirrel more than them! It's the only explanation, but who cares! BFF Philly and Filbert are back together again! 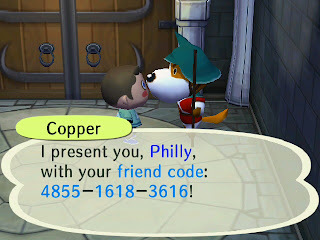 Additionally, if you would like to become a friend of SuperPhillip's Animal Crossing alias, Philly, feel free to hit me (SuperPhillip) up with a message in the comment section, or e-mail me at superphillip32@hotmail.com. 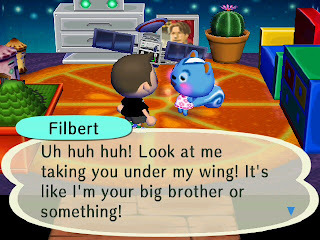 Perhaps YOU could beat out Filbert as Philly's BFF (but probably not). 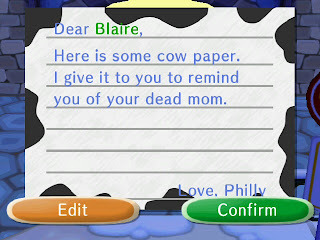 ...And doesn't like Blaire today. I'm exceptionally proud of this latest level. I didn't have room to fit it into one part, and I think that's for the better. Watch as Dr. Christian's latest creation gives chase to SuperPhillip along several rooftops and through a construction yard until the action-packed finale! Another thanks to SheepLordLBP for his recording of my level! P.S. If you missed part one or level 0-1, check them out here. We all have things we don't like in games whether they're design choices or just aesthetic touches. Perhaps you don't like cel-shaded games, effeminate main characters with big swords, mascot racing games, bald space marines, or something completely different. This is just a handful of my gaming pet peeves that unleashed the caged animal inside of me. Rawr, SPC faithful. Rawr. This is one of my top ones. I've always been fascinated with exploring game worlds whether they're 2D or 3D. This particular peeve generally occurs within 3D realms. You see an interesting-looking area which you may think holds a secret or hidden item, but when you run up to access the area, your progress is halted by an invisible wall-- a barrier of impassibility blocking an area for no good reason that the player should be able to traverse upon. It's difficult to fathom why the designers didn't just place a visible barricade or something to notify to the player that, "hey, you can't get passed this, so don't bother trying!" 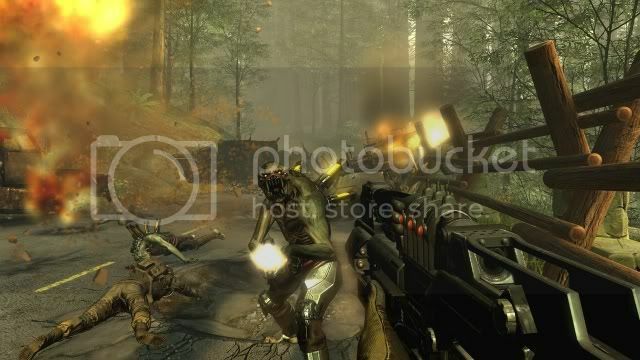 A recent example of another instance of this peeve is Resistance 2 for the Playstation 3-- it's just the most recent game I've really enjoyed, so that's why I'm using it. In the single-player mode, railings that you logically should be able to leap over are impossible because of the invisible walls floating over them. Want to just jump off the staircase instead of going all the way down the steps and around? Tough, buddy! Rubber-band AI is primarily used when talking about racing titles, but it's also in sports games and other genres. The concept of this peeve in racing terms is that when the player is far ahead of the AI in a race, the AI will suddenly and for all intents and purposes within the player's limits of the game, impossibly catch up to the player. 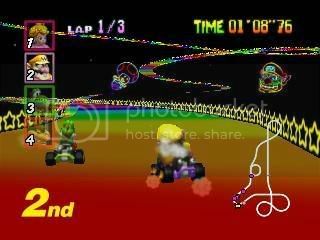 The game can give the AI such unfair tricks as double or triple speed or unleashing a plethora of luck-based items as in Mario Kart Wii. This peeve usually stems from lazy design when it comes to the AI as well as a false sense of challenge. Mario Kart 64 - Hit the infamous shortcut in Rainbow Road where you skip almost half of the track and do so on all three laps, and somehow the AI will be on your tail by the end of the race. Need For Speed Underground - Be far ahead of the AI, and they will speed up to catch you. Alternately, be behind of the AI, and they will slow down to let you catch up. This type of design forces the player to drive much more carefully throughout the duration of a race. One goof-up and it was all over. Banjo-Tooie - Stupid here had to beat Canary Mary at Cloud Cuckooland by jamming on the button like a madman for three seconds, pausing the game to catch my breath, unpausing, and continuing this process until I won. Little did I know that this race had rubberband AI. The faster you go, the faster Mary goes. It can get to a point where you go too fast that Mary gets so fast that it's impossible to beat her. And How Was I Supposed to Know That?! This is a notorious design choice in early games around the NES time, but it's also one that we've seen examples of in more recent games. The idea behind this is solving a puzzle or progressing further into the game through a task or event that isn't intuitive or logical at all. One that you most likely need to consult a walkthrough for help or like back in the old days, a friend, a neighbor, or an issue of Nintendo Power. Castlevania: Symphony of the Night - This is an optional one, but for those of us are who completionists, it really bites. This involves passing through a tunnel as one animal transformation, then passing through it as a different animal, and then the other animal transformation in a specific order to open a secret area. Sonic the Hedgehog 3 - Oh, Carnival Night Zone barrels of doom, how I hate how you made a moron out of an entire generation of gamers. 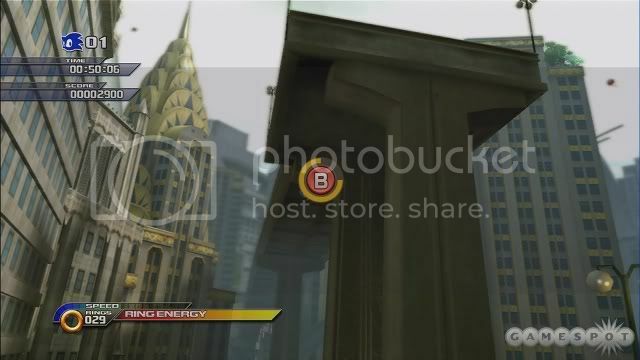 The solution to solving the barrel impeding Sonic's progress was not to jump up and down on it as one would think because earlier in the zone, Sonic had to leap on a barrel just to reach a higher platform, but to hold the control pad down as if it were an elevator. Oh-ho. You slay me. What a wonderful sight to see the Ice Cap Zone when I was a child. No idea how I made it passed then, but now I do! Final Fantasy XII - The Zodiac Spear is one of the character's ultimate weapons in the game. The catch is that if you opened any of four specific, totally unmarked treasure chests in the game, you won't be able to receive it. That's simply asinine to me and a lot of other players. but it can go to Hell, too! I saw this scene already. I don't need insult to injury by seeing this cutscene once more after the same boss handed my metaphoric rump to me. No more, I tell you! I have a life to live! ...Well... Other games to play, dammit! Dead Space - Since most of what happens is in-game, there's long periods of conversation between characters. If you've seen these more than once, then it just gets annoying waiting around for them to stop squawking! Tales of Symphonia: Dawn of the New World - Maybe if the main character wasn't a total whiny tool or had a god-awful voice I could tolerate watching the cutscenes. I loved them in God of War. I loved them in Resident Evil 4. Why? Because they were new then, and they were used sparingly and well (most of the time). Though when it gets to the point where the game boils down to hit these 32 buttons as they flash on the screen or die, I get very bored. If I wanted to play Simon Says, I'd play... Simon Says. That wasn't that good of a joke in retrospect, but I think my point has been made. Sonic Unleashed - QTEs to get to higher paths, QTEs just to survive, QTEs to finally attack a boss, but if you fail, you have to start a long, tedious, arduous process all over again. It's not fun, and it always came off as lazy. Prince of Persia - Truthfully, the whole game felt like one big QTE, but there were multiple instances where a string of long button press events occurred. In platformers I'm a fan of collection. When it gets too crazy like Donkey Kong 64, even the platforming fan in me has to say "that's wrong like Donkey Kong". Don't worry, readers, I, too, am groaning at that one. Collecting is fun, but if it's more tedium than entertainment, that's just the total opposite of what a video game should be. A game should seldom ever feel like a chore. Having to collect 300 back issues of Redbook does not a fun game make. 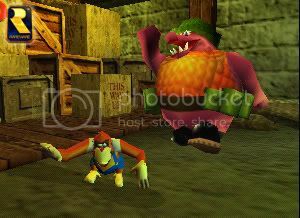 Donkey Kong 64 - As if switching out one of the five Kongs to collect different colored bananas that only a certain Kong can pick up, multiple golden bananas-- five for each Kong in a given world, and several crowns weren't enough, to reach the final boss, players had to collect the Rare and Nintendo coins by playing two seemingly-optional arcade machines within the game. Grand Theft Auto IV - A huge, sprawling city... 200 pigeons to shoot... a worthless helicopter as the prize... It'd make it much less annoying if it didn't take a walkthrough for a normal person to hunt down them all. Prince of Persia - The need to scour uncorrupted lands for light seeds slowed the pace of the game down considerably. Not all needed to be collected, but if you wanted to go for them all, it'd take more dedication than most of us would like. Even enemy Klump has to help out to find all the hidden goodies. Do you have any pet peeves regarding gaming or game design that you'd like to share, or do you not find as much annoyance with any of my pet peeves as I do? Let everyone know in the comments section located directly underneath this article! For the past two weeks we took a listen to various songs from the Sonic the Hedgehog series. Now we're moving onto another fabled blue mascot with Mega Man, Mega Man, and more Mega Man! This week, we're looking at Mega Man 1-5, so without further ado, let's hop into it! We'll start off with the stage theme of Cut Man from the very first Mega Man game. This is the Power Battles version of the track. This is one of the more popular tracks from Mega Man 2, and I enjoy it as well. It's the first theme of Dr. Wily's castle! Rock on, Rockman! Wow. Look at that track title! This track comes from a very rare official Capcom CD release of classic Megaman tunes, Rockman Arrange Version Special. There were two volumes eventually released. This song comes from the second. It's arranged by performed by Capcom's former in-house band, Alph-Lyla, who interestingly enough had Yoko Shimomura (Kingdom Hearts composer among others) on keyboard. Dig that awesome bass! This track continues our run through the classic Mega Man series with a listen to Bright Man's stage in Mega Man 4. I personally think the fourth installment gets a lot of undo disdain. I happen to love it! We're halfway through the classic Mega Man series now as we reach Mega Man 5. The track I'd like to represent this game comes from Wave Man's stage. The entire soundtrack was composed by Mari Yamaguchi who also did work on Ghosts 'N' Goblins, Breath of Fire, and Magical Quest Starring Mickey Mouse. Next week we look at the latter half of the classic Mega Man franchise with Mega Man 6-9 plus a special bonus track from a recently released anniversary album. We'll see you then! It's a shorter month so that means less days to vote! Before we get to new business, let's take a look at the old with January's CCC. 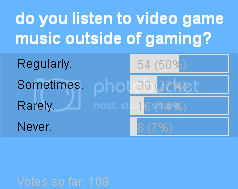 A clear majority regularly listen to video game music outside of their many gaming sessions. I wonder what type of games the enjoy listening music from. Are you catching and enjoying SuperPhillip's Favorite VGMs posted every Monday then? 21% seldom listen which is perfectly fine and dandy, too! Let's see what February's census asks. I bet it's another incriminating question, that no good busybody! I write a lot of content for the site. No, that is not to brag-- it's to set up this month's census question! Honest! I write reviews, editorials, lists, themed SPC segments, news, and the occasional preview. The February Central City Census asks which type of article do you enjoy the most? It's new month, so let's take a look at what's in store for February. The list is subject to change.